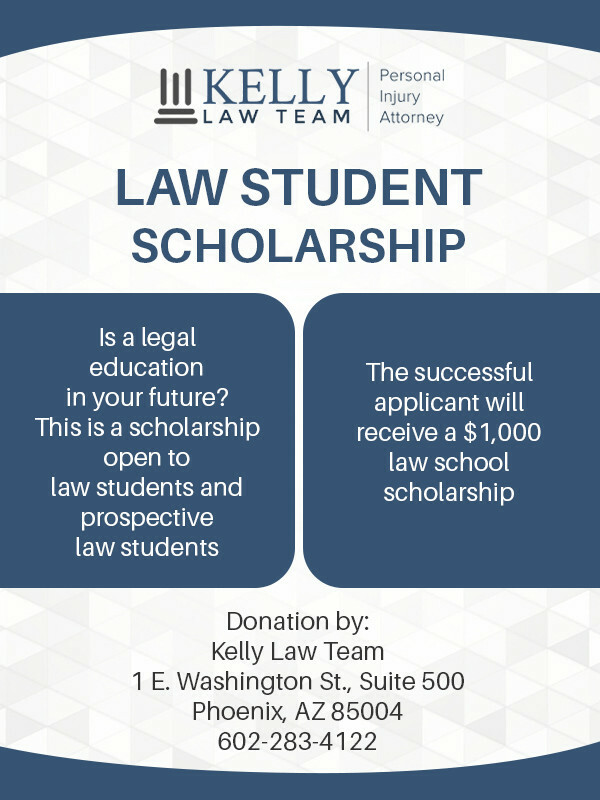 The Kelly Law Team (KLT) has established a scholarship for an individual interested in pursuing his or her legal education. The scholarship is in the amount of $1,000, and will be applied to defray the cost of law school tuition. Attending law school and entering the legal profession can provide a person with a number of benefits. Among those benefits is the ability to make a difference in people’s lives. Whether it’s choosing an area of practice that allows you to help people in their everyday lives, doing pro bono work, or engaging in community activities, a legal education can be the touchstone of a career that focuses, in part, on helping others. The scholarship, in the amount of $1,000, is being offered to assist in the payment of tuition to law school. It is not required that an applicant be enrolled in law school at the time of the submission of his or her application. However, the scholarship funds must be utilized within one year after the date of the announcement of the winner. The $1,000 award will be paid directly to the law school selected by the winner. The scholarship is open to citizens of the United States who are enrolled at, or who intend to enroll at a U.S. law school accredited by the American Bar Association. an (optional) essay of not more than 750 words discussing how you will use your law school degree to make a difference in the world. The selection of the winner will be at the sole discretion of John Kelly, founder of the Kelly Team. Mr. Kelly’s decision will be made no later than March 22, 2018. Your application, including the uploaded statement and essay, is the property of the Kelly Law Team. We will measure website traffic, but this information, and your contact information, will not be disseminated to any third parties, except that we may disclose the information (including, but not limited to, your name, statement and essay, on the KLT website) to publicize, describe or report on our scholarship program. 6-3 Answer to prove you are human. Thanks! When you provide us with information, it becomes the property of the Kelly Law Team. We do not sell your information to anyone, nor do we disseminate the information to third parties other than to report on or publicize the scholarship or the KLT scholarship program.